Eunice Napangardi took cultural responsibility for her totem, Yuparli - the Bush Banana. The bush banana grows on a vine with small, green, oval shaped fruit. It grows near trees which provide shade and support in the desert environment. The bush banana thrives near creeks and waterholes and is an important food source in the traditional bush food diet for Aboriginal people in the desert regions of Australia. Eunice is noted for her connectedness to Yuparli which has both nutritional and healing properties. Born at Yuendumu in the early 1950s, Eunice’s languages are Luritja and Warlpiri. She is the sister of Pansy, Rene Robinson and Alice Napangardi, with whom she shared many Dreamings stories. Eunice was an apprentice to her late husband, Kaapa Tjampitjimpa, and helped him with his paintings for several years in the early 1980s. 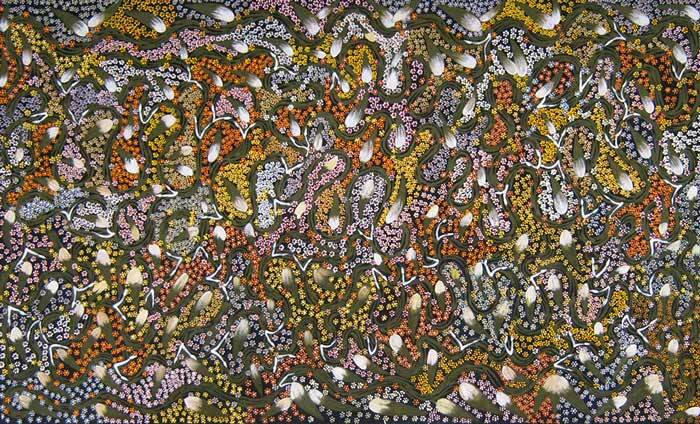 Gaining experience and technique, Eunice emerged in the late 1980s as an artist in her own right, becoming one of the Central Desert's leading Aboriginal artists. Kaapa was one of the first artists to paint in Papunya and was most likely responsible for the Central Desert painting movement as we see it today. Eunice's Bush Banana paintings are world renowned. 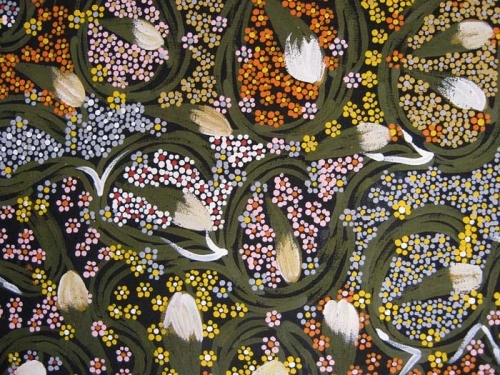 Working alongside Kaapa and later Maxi Tjampitjinpa (her second husband), provided Eunice with the opportunity to become one of the most important Aboriginal women artists to emerge from the desert and has earned her own place as a master - demonstrating excellence, great technique, and artistic flair. Eunice is noted for her connectedness to Yuparli - the Bush Banana which has both nutritional and healing properties. It is of immense importance to the Aboriginal people of Central Australia. Eunice passed away suddenly in 2005. The Alice Springs Airport commissioned a large Eunice Napangardi painting for the inaugural opening of the new Airport Terminal in December 1991and it now hangs in the QANTAS passenger lounge in Alice Springs Airport. Eunice has exhibited at the Australian Embassy, Washington DC (1999), the United Nations Building, New York City (1999), and with Pansy Napangardi in Brisbane. In 1992, Eunice's work was included in Modern Art-Ancient Icon, a travelling exhibition, starting in Washington DC, sponsored by The World Bank.